Contrary to what most Americans know, Wiener Schnitzel isn’t just a chain restaurant. In fact, a Wiener Schnitzel is an Austrian dish that is considered a delicacy in its beautiful capital, Vienna. There are also similar dishes, such as the Italian milanese, the American chicken-fried steak, and Japanese tonkatsu. But nothing beats the original! According to Austrian law, a Wiener Schnitzel is a veal cutlet coated in bread and then pan-fried. National Wiener Schnitzel Day is every September 9. It’s the perfect opportunity to try a dish from a part of Europe we don’t explore as much. Records of the Middle Ages show that Arab merchants would cover their meat in breadcrumbs before cooking it. Romans left a record of a dish called Cotoletta a la Milanese, which was a dish made of veal, breadcrumbs, and lemon. It had bone according to records. It is said that an Italian from Milan coined the term we now know as Wiener Schnitzel, and it became popular in 1862. Figlmüller is a Viennese restaurant that is said to be the home of the Wiener Schnitzel, and is a popular tourist destination as a result. Wienerschnitzel is also a hot dog chain that was founded this year, causing many Americans to associate the term with hot dogs instead of breaded meat! You might be fortunate to live in an area where there's an Austrian restaurant. We bet they have Wiener Schnitzel on the menu and a simple Google search will help you find your nearest location. Finding a piece of veal might be a bit difficult, but you can probably find it at a specialty butcher or well-stocked grocery store. You can pound the veal cutlet, then dip it in flour, egg, and breadcrumbs. Just be careful not to press the breadcrumbs against the veal. Pan-fry until golden brown and serve with the garnish or side dish of your choice. Though this may sound counterintuitive, the popularity of vegetarian dishes means that you'll be able to find a vegetarian Wienzer Schnitzel somewhere. If not, you can always cook your own version using soy, seitan, or tempeh. Plus, you can include vegetarian friends in this national day! A. Wiener Schnitzels are simple, but tasty! 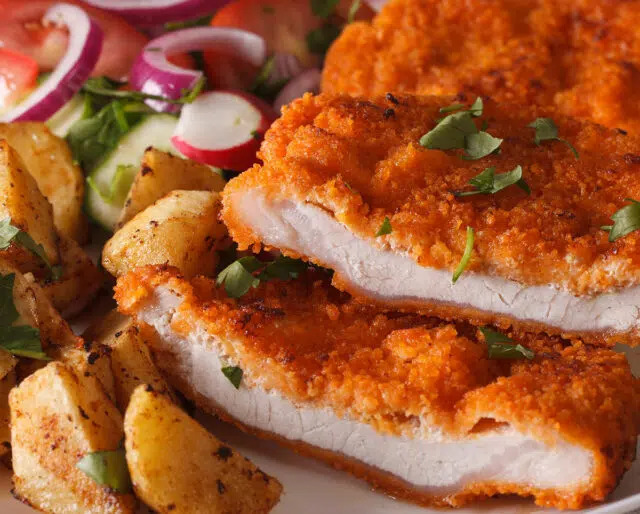 Wiener Schnitzels are pan-fried and served with simple garnishes. But hey, what matters is that this fried combination of veal cutlets and breadcrumbs never disappoints. If you eat a Wiener Schnitzel in Austria or an Austrian restaurant, chances are you will receive the traditional lemon and parsley garnishes. Some places may also serve it with a salad, mashed potatoes, or even fried vegetables such as mushrooms. The entire world has heard about the wonders of hamburgers, tacos, pad Thai, and other dishes. Wiener Schnitzels are tasty and deserve more credit than they're currently given. They're not as easy to find, but they're worth trying in the end.